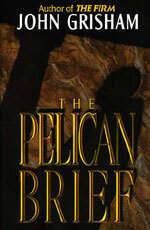 adapted as "The Pelican Brief"
To Darby Shaw it was no more than a legal shot in the dark, a brilliant guess. To the Washington establishment it was political dynamite. Suddenly Darby is witness to a murder -- a murder intended for her. Going underground, she finds there is only one person she can trust -- an ambitious reporter after a newsbreak hotter than Watergate -- to help her piece together the deadly puzzle. Somewhere between the bayous of Louisiana and the White House's inner sanctums, a violent cover-up is being engineered. 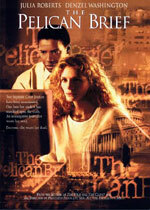 For somone has read Darby's brief. Someone who will stop at nothing to destroy the evidence of an unthinkable crime.